The Zircon Leak Alert electronic water detector is now available in a 2, 5 or 8 Pack. This Home Pack includes 8 leak detectors to meet the specific needs of your property. Please note batteries are included in the eight pack. The Leak Alert is a water sensor that emits a loud (85Db) alarm that will sound with any direct water contact. Protect your property from water damage by placing your Leak Alert in any place that has potential for flooding or leaks such as near water heaters, sinks, dishwashers, sump pumps, and more. The Leak Alert is a water leak sensor and water alarm that requires an easily installed 9V battery. Each water detector alarm is battery operated, wireless and fully automatic so no wiring or hub is required. Just like your smoke detectors, remember to check and replace your Leak Alert batteries every year. Should flooding occur, the water leak detector will float and continue to sound an auditory alarm so it can be heard from a distance. The Leak Alert has a low battery warning for optimum performance. 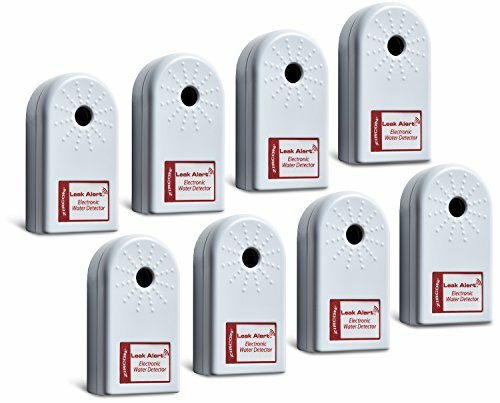 The Leak Alert is the perfect water detector for HOA, multi-unit, and multi-story property managements. It is also the best water detector to protect your apartment, home or office. The Zircon Leak Alert Home Pack allows you to save money and protect your entire property with one purchase. Place in basements, bathrooms, kitchens, or wherever there is a potential for leaks. Common placements of the leak detector are near sump pumps, water heaters, washing machines, dishwashers, under sinks, etc. If you have any questions about this product by Zircon, contact us by completing and submitting the form below. If you are looking for a specif part number, please include it with your message.